With the support of our team, we have been able to meet requirements of the clients with the best class range of Wind Tower Ladders. Under this range, we offer Platform Steps Mobile Double-Sided Access and Wind Towers. Made up of supreme quality basic material, these products satisfy defined parameters of the industry. Furthermore, with a view to cater to the divergent demands of the clients, we offer these products in different sizes and specifications. Detailed description of the products is provided below: demands of the clients. Supported by diligent and qualified professionals, we have been able to bring forth commendable Industrial Wind Tower Ladders. Our professionals manufacture these products by making use high-grade basic material, which they procure from the trusted vendors of the industry. They design these products with utmost precision as per the requirements of the clients and industry laid parameters. Our clients can avail these products in different specifications and sizes at an economical price. 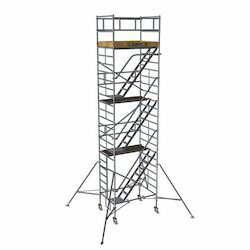 Looking for Wind Tower Ladders ?